The Paleozoic era re-emerges every spring. You thought it was long gone? Way before dinosaurs roamed the earth, the seas were full of trilobites, brachiopods, crinoids, corals and many other species. Between 251 million and 542 million years ago, the Paleo was rich with life forms. Such plants as cycads, ferns and primitive conifers were thriving. 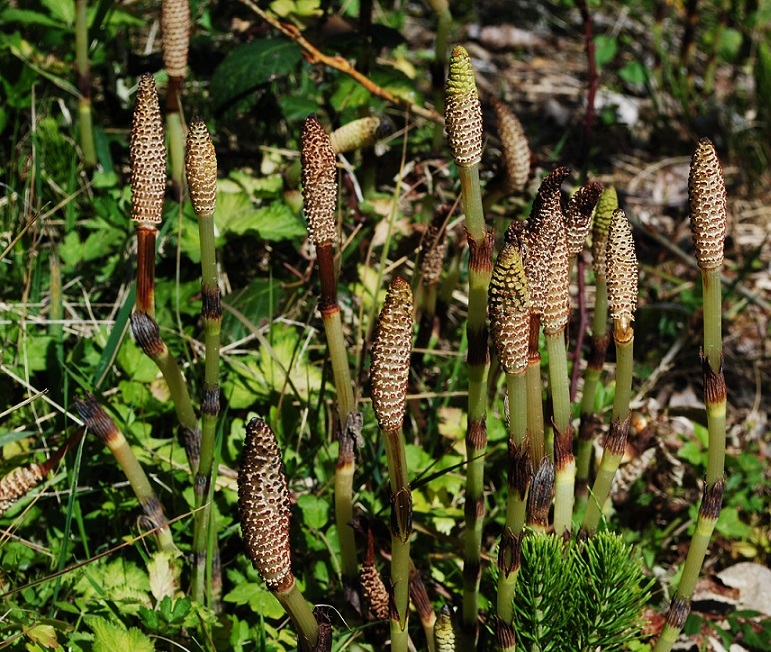 The class Equisetopsida dominated forest understories, and within that class was the genus Equisetum, to which horsetail belongs. 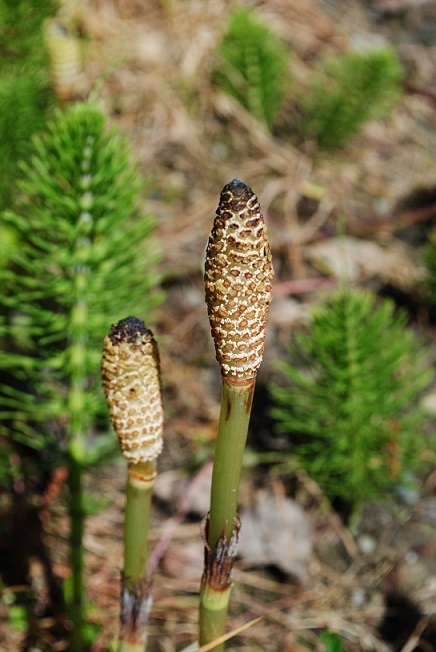 With spring comes the horsetail. In winter it disappears, but as the seasons change, the stalks begin to appear and, like little herbaceous soldiers, they mount their campaign of annexation. It’s easy to see why it’s survived for hundreds of millions of years and flourishes around the globe today. It’s an interesting plant. If you break it apart, you’ll find the stalk is strangely hollow. Primitive for sure, but persistent as cockroaches. It produces by spores rather than seeds, like mushrooms. Right now, the reproductive stalks, which make me think of asparagus, are full of very fine pollen that releases into the air in small clouds when you disturb them. I discovered this as I was cutting down some stalks near my backyard. I was horrified to watch as the pollen drifted out. I do not wish to assist in the horsetail’s reproduction. 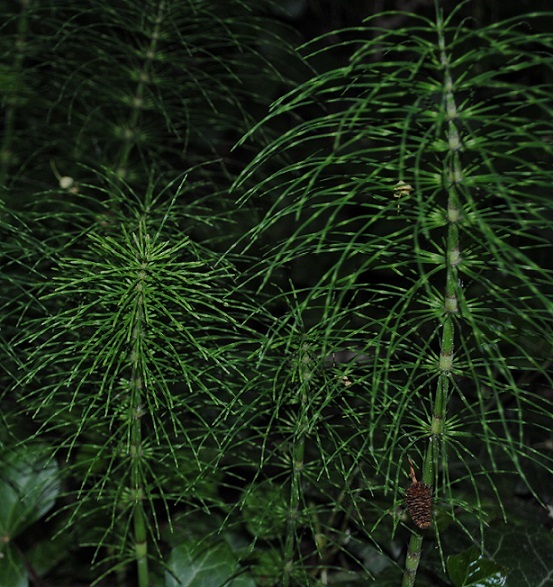 Horsetail is not loved by homeowners. It’s invasive, marching across the ground by way of underground rhizomes, much like the bamboo so wisely planted by my home’s former owner. It grows about a foot tall. You can pull them up or cut them down, but you basically cannot eradicate it. It’s been declared a noxious weed in many places. My only defense is to whack back the growth a few times each summer. But I continue to marvel at the horsetail, secretly applauding the Paleo survivor. Wonderful but obnoxious plant much as you say like bamboo. Another plant not old old but persistent is Hollyhock. My mother planted them not realizing they fall down without a stone or wooden fence to lean on. We tried to get rid of them but their roots go to China! Leave any piece of the root and next spring you have more of them. I did not know that about hollyhocks. I was thinking of planting them in my garden! I’m all for volunteers, in a certain place.